Our company is engaged in manufacturing and supplying Weigh Filler at reasonable prices. Set up with timer belt controlled by Steeper/ servo motor drive, the offered compilation has an alphanumeric, LCD back lit display through micro controller based system. Vastly demanded by food processing and packaging industries, our range is quite reasonable. 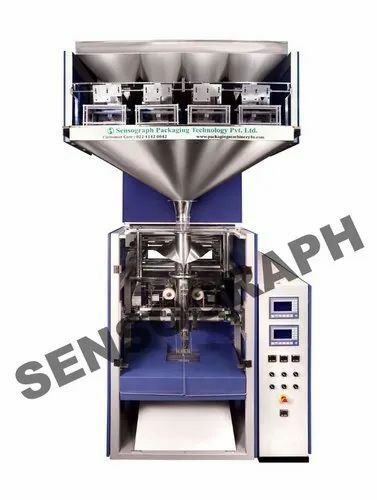 The material feeding system is weighmatric means it feed the material to the pouch by weighing. The actual weight of the material is displayed on the 5” display provided on the front panel. Depending upon the output requirement, one can choose number of heads of the weighing system. Homogenous coarse grained products such as rice, pulses, Sabudana etc. Specially suited for Poha ( Rice Flakes), Murmure, corn flakes, candies, etc.